I absolutely love taking photos of my daughter. I’m the first to admit that I do go a little mad taking hundreds of photos, I just don’t want to miss a thing. I want to capture every milestone, every trip, day out or funny moment. It’s surprising how much you do actually forget. This is why I want to talk about Scrapbooking for kids. 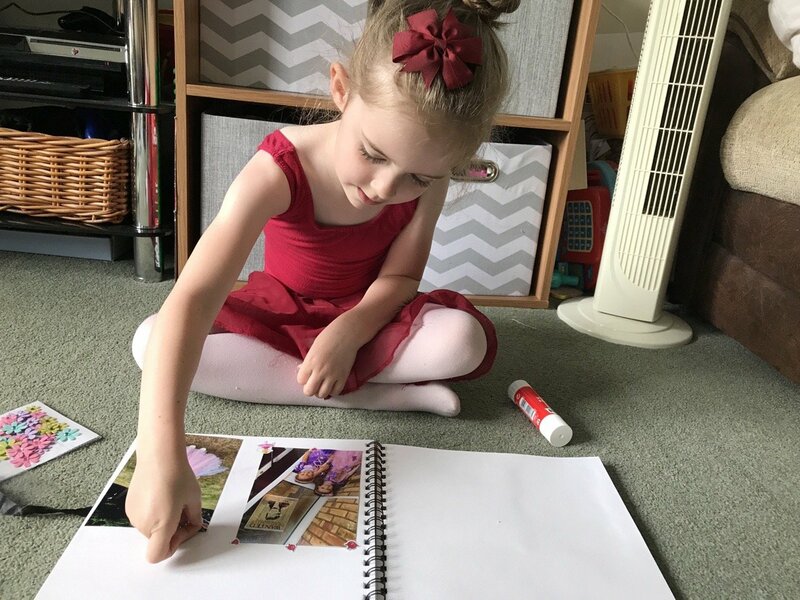 It’s not only a great way to document your adventures but it is a brilliant way of getting your little ones involved too. FreePrints – you get 45 free 6×4 free prints to use each month. Delivery is £3.99. Snapfish – you get 50 free 6×4 free prints each month. Delivery is £2.99. So once you’ve got packets of photos arriving through the door, what next? 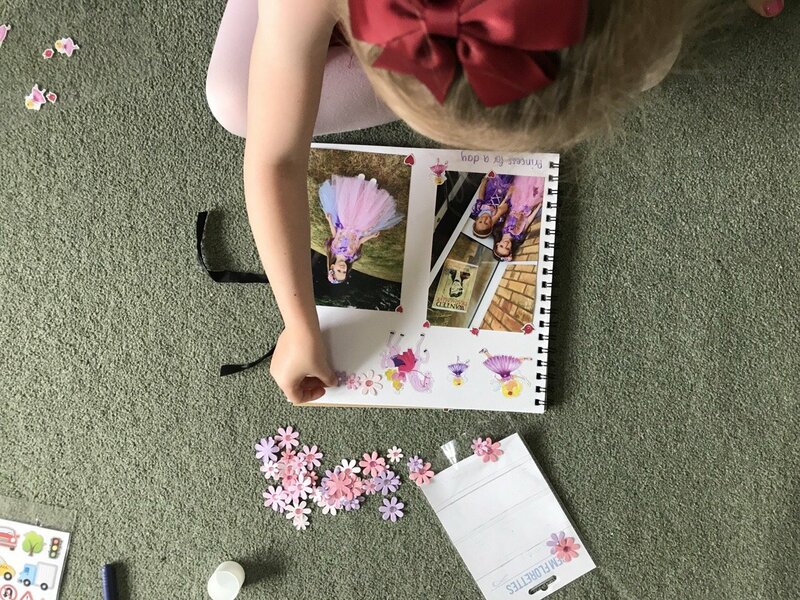 I really wanted to involve my daughter so thought Scrapbooking would be perfect. 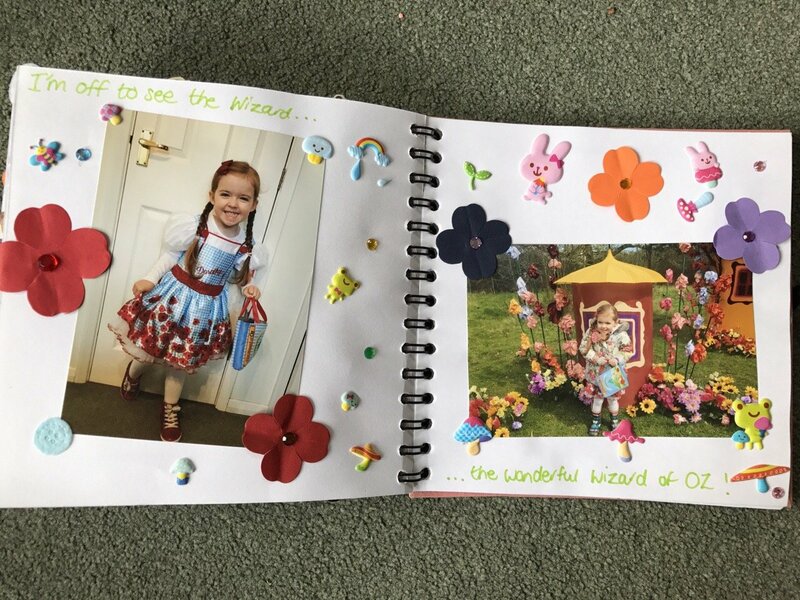 Rather than display them in a boring photo album, I thought a scrapbook decorated by her own fair hand would be so much more personal. I used to scrap book myself years ago and if there’s one thing I remember, it was super ‘expensive’! We didn’t really have many options to purchase decorations and supplies so it meant the majority of the products were from the USA making it an expensive hobby to have. The shops that stocked Scrapbooking products were also few and far between. 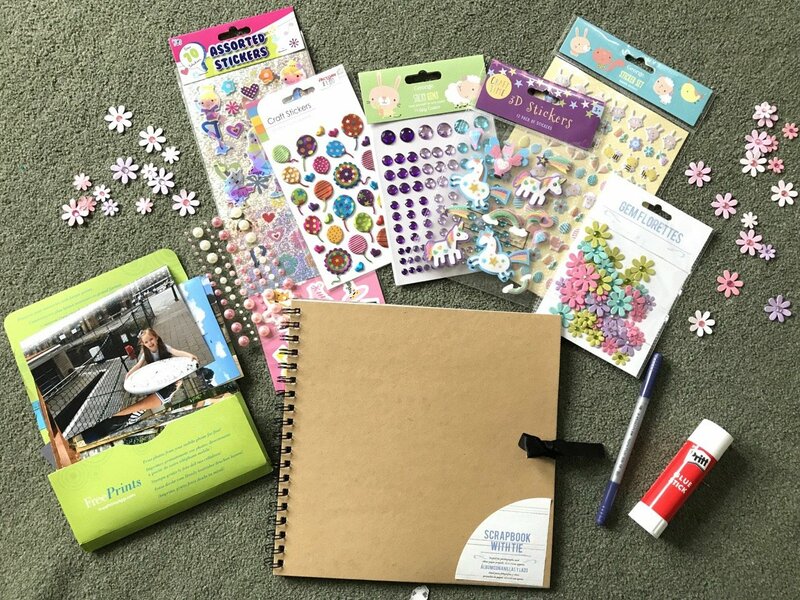 Great news is, it’s now cheap as chips to scrapbook! We have an abundance of shops that stock really cheap craft items. Most supermarkets have a craft aisle now and pound shops have a great range of craft and Scrapbooking products. 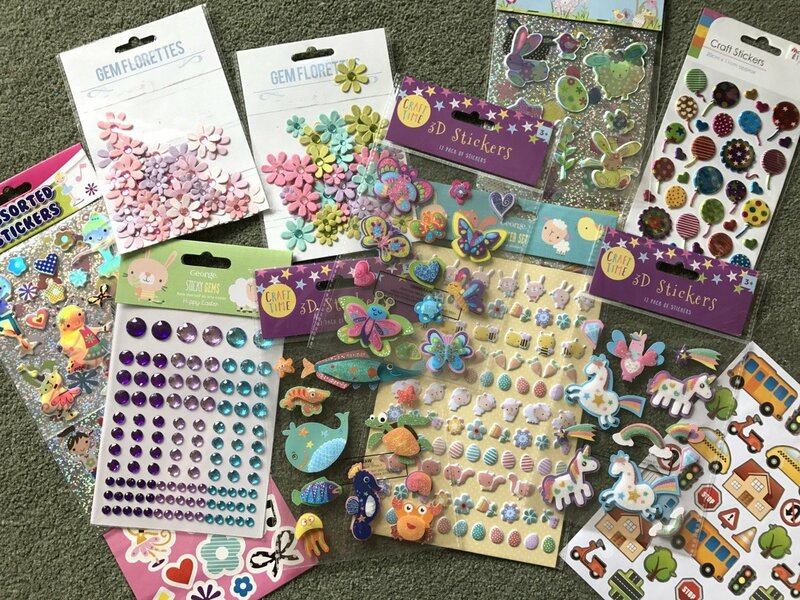 Every time I pop into a pound shop I buy a couple of packs of stickers or embellishments. That means I can add to our ‘stash’ without paying out huge amounts in one go. Well, when you’re Scrapbooking for kids it’s best not to make it too complicated for the younger ones. 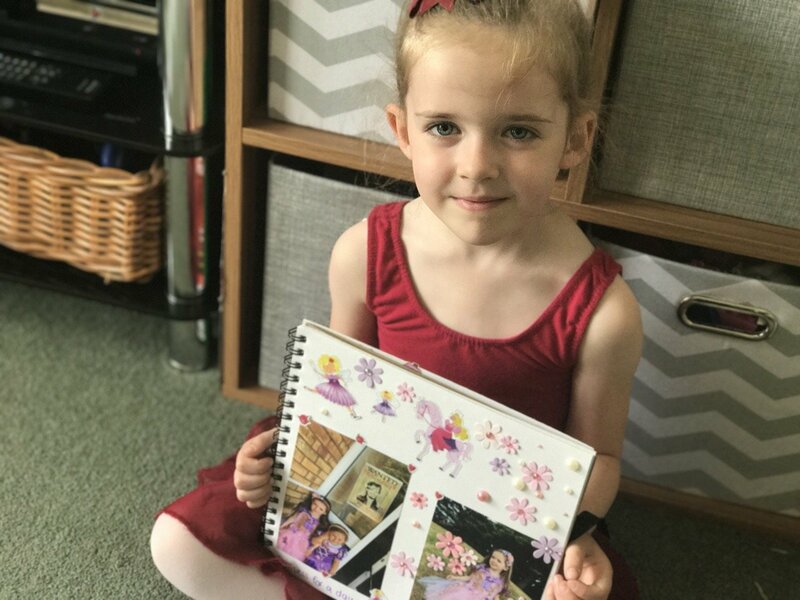 We started Eden’s scrapbook when she was just two years old. We kept to using just stickers so she could stick them in by herself quite easily, rather than making a gluey mess! First off you need a scrapbook album, anything between 8 to 12 inches is perfect. Thicker card pages are recommend rather than paper, but it’s your scrap book so your choice. The one we use was £1 from a pound shop and about 10 inches square. It also has a nice ribbon to tie the book close. 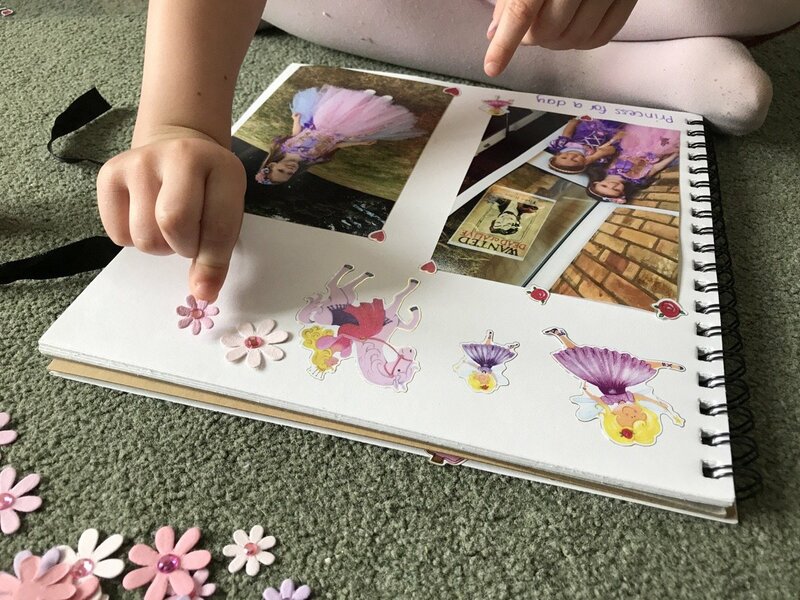 You’ll also need a pen to write what the page is about, a glue stick to glue in your photos and then some packs of stickers or embellishments to decorate the pages. I often save tickets and stickers from our days out and stick them in too. Initially the control freak in me wanted to step in, takeover and make it ‘perfect’, especially when Eden was so small! I had to fight against my instincts and just let Eden be creative, in the end this is what makes them perfect. 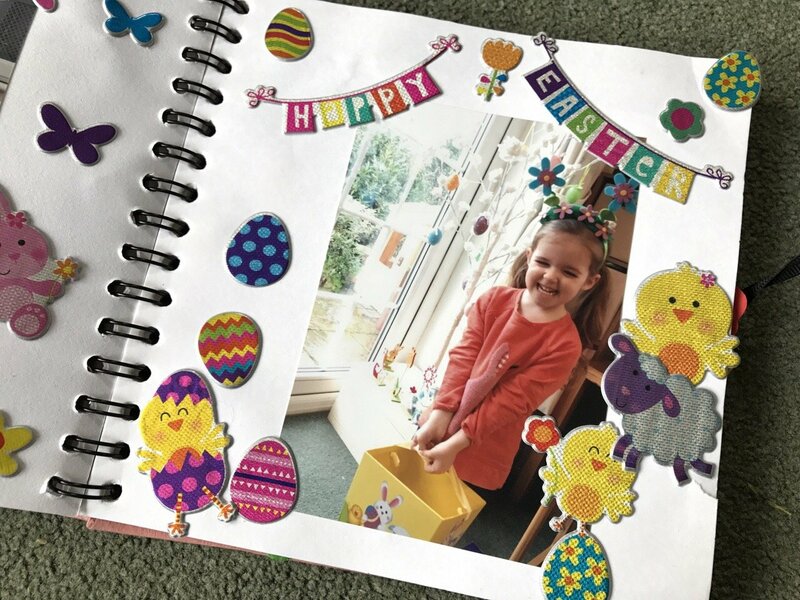 On each page, Eden selects which photos she wants to use, sticks them in and chooses her decorations. I normally just help out with writing the labels for her page, but I’m sure she will be doing this herself very soon. Some pages are of course more beautiful than others but each one is created with love. 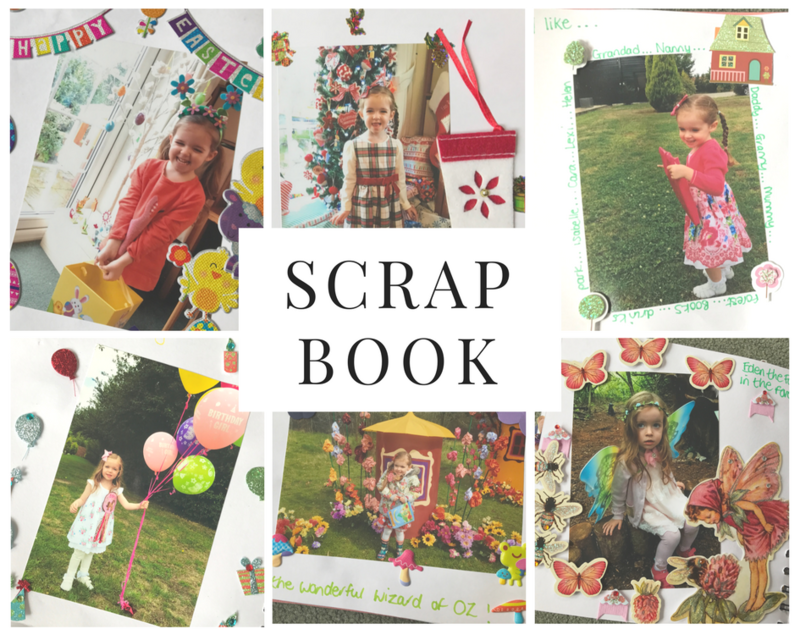 I treasure Eden’s scrapbooks and it’s something that Eden loves to do, she regularly asks ‘Mummy can we do some Scrapbooking today?’. I’m only too happy to oblige, I look forward to looking through them all in years to come and treasuring every captured moment together. 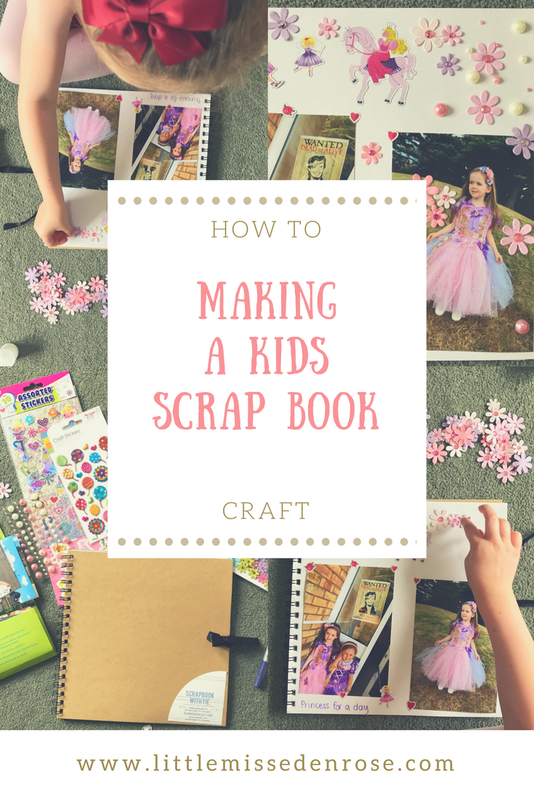 Thank you for reading ‘How to – Scrapbooking for kids’. Eden meets Buttons – Cadbury’s Adopt a Cow Campaign!